Loop Templates are something that an office can set up and help their agents me more efficient and turn in the files in a proper order. This blog post is going to focus on office or brokerage options in Loop Templates. Agents if your office is not using these, feel free to forward this to them so they can utilize their tools in dotloop. Loop Templates can be found under “Templates” on the brokerage admin profile. The top option on the left says “Loops”. If you have not set up any loop templates, you will see a screen that says “Try it now”. If you have, then you will see all of your loop templates on the left below “Loops”. Click on the “New Template” or “Try it now” and get started. It will pop up a screen that asks you to name the loop template. You can use anything and some examples are: Residential Listing Package, Residential Sale Documents, Rental Listing, Referral (Sending, not receiving). Once you have named it, you will also have a drop down below that asks you what kind of loop, if you are setting up a real estate transaction, you will want to select “sale”. This will automatically add the correct fields and roles needed for that type of transaction. At the top is where you add a folder for the documents and then add the documents. If we are working on a “Residential Listing Package”, then we might add folders with the names: “Listing Documents”, “Offer Documents (1 per folder)”, “Inspections, Reports & Other”. By adding the folder names the way the office wants to receive them, they are more likely to come in complete in the correct format according to your office needs. Now that you have folders, add the documents or placeholders that you want in each folder. I should note that you can only create placeholders in the document section and not on the loop templates, but once you create them in your document templates, you can load them into your loop templates. If you leave your loop templates page to go create and organize the documents in the document templates, don’t forget to “save” at the bottom so you don’t loose what you have done. The next section is for the “people”. Offices typically don’t add many people in this section, but if you have a title company or attorney that everyone uses, then this is where you would add them. Below people are the “Tasks”. This is where you can add any compliance or task lists that you want to appear on every loop using this template. The negative is that you will have to type them out and can not load from your task list templates, but you only have to type it once. This will save you time from adding the task lists later when doing compliance. The “Roles” section is interesting because you cad add roles that you might have wanted to use before, but were not able to edit. A good example of this is to add “Referral Agent”. Many times referrals are sent and received and we don’t have a standard “role” in the loop. Along with adding roles, you can add fields of information that you want for each of these roles, for example the referral agent’s address or phone number. The bottom is my favorite part of the loop templates, which are the “Fields”. What is cool about this section is that you can now require information to be input before an agent can submit their file. For example, if they are turning in a listing, you can require the agent to enter the “List Date” and “Expiration Date” and “Original List Price”. By requiring this information, you insure that you get exactly what you need completed, filled out. It also allows you to sort for this information as well. If it is blank you won’t find the loops sorting by the price, list date or expiration date in this example. New fields can also be added in any of these categories or create a new category. Some offices have certain forms that they want the agent to complete and maybe that information has to be put into another system like MLS or franchise system. 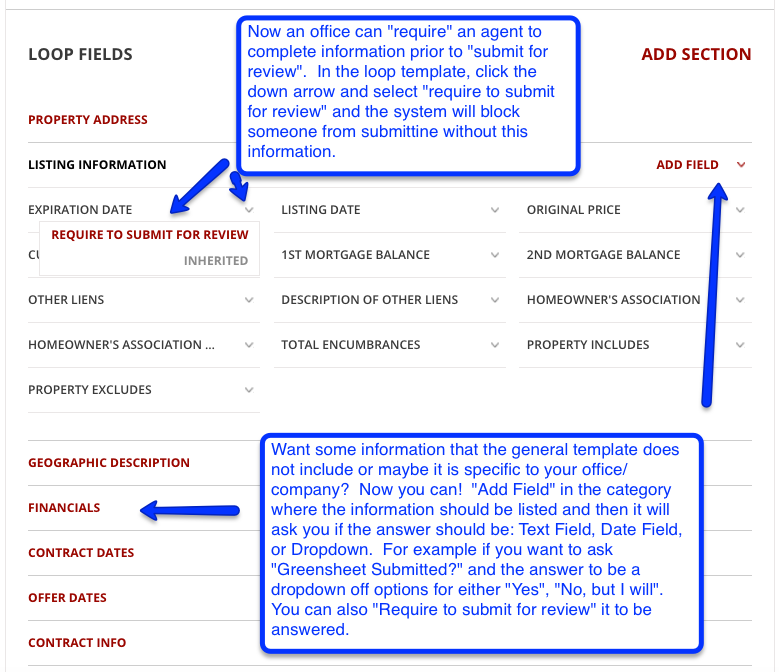 You could add a field to ask the agent “Greensheet Completed?” and make that a multiple choice, fill in the blank or an amount. Last but certainly not least, don’t forget to “SAVE” and in order for your agents to see these, you will need to “Enable Template” at the top of each. Until you enable them, the agents can not see them. This gives you time to get them the way you want them and the activate them for all to see. There are endless possibilities with these loop templets. Happy looping and enjoy creating new possibilities of organization for your office! As a REALTOR®, we know many service providers. The question is “Who do you trust to provide a great service to your clients?” A great way to include those providers into your transactions as a Trusted Service Provider or TSP. If you work with the same title representative, closing coordinator, or lender you can add them as your TSP so it is easier to “connect” to them, so here is how it works. Once logged into your dotloop account, click on the “People” section and the top one on the list to the left says “Trusted Service Providers” right above the “Contacts”. If you do not see TSP’s then you are not a premium dotloop user and this is necessary for this feature. If you have no TSP’s added it will show a button at the bottom that says “Get Started for Free”, click on that button and it will pop up a window that asks the field the TSP is in, for example: Mortgage, Escrow/Title, Attorney, Home Warranty, etc. Then you will enter the Name and email of the TSP. More than one TSP can be added at a time. They will not display in the loops until the TSP becomes a premium user. 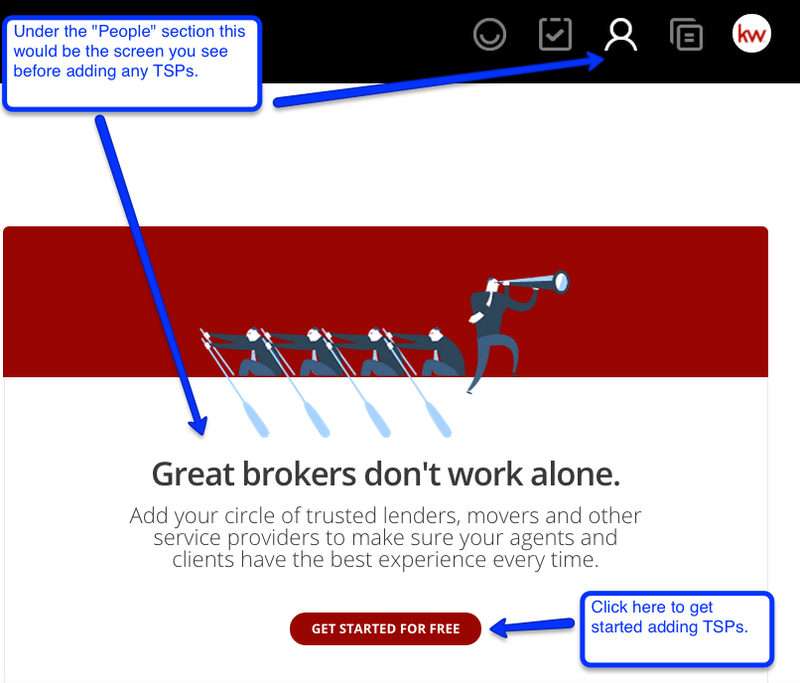 The cool thing about the TSP becoming a premium user is that it is not just for 1 agent or office. If trusted service provider is a premium user that allows them to be seen as a TSP for any agent or office, on all of their loops and there is no limit! Adding TSP’s do not automatically share any documents or people with the TSP. They only know that they have been added to a loop so you will still need to share any information that you want them to seas with any other person you add to the loop.